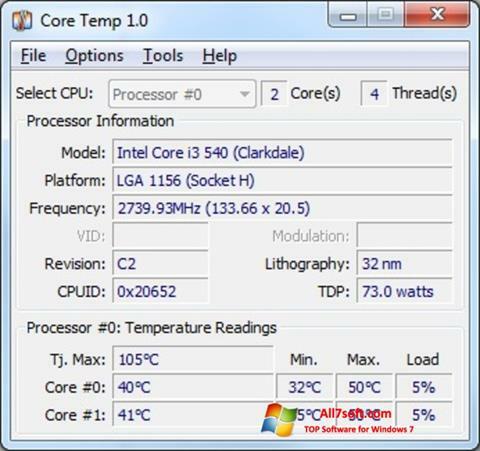 Core Temp for Windows 7 - a utility for monitoring temperature fluctuations of the CPU. The application uses technology Digital Thermal Sensor, allows you to display data in real time separately for each core and independently of the motherboard. The utility includes the ability to display all installed components of the computer, the detailed characteristics of the process used and the size of the heat pack. The program has the function of protection against overheating, allows you to turn off the computer when it reaches a certain temperature, it can display tooltips and maintain a detailed log data. You can free download Core Temp official latest version for Windows 7 in English.